We open from 11am, serving hot & cold drinks from our well stocked bar. Food is served all day from Midday with an extensive menu and specials boards which cater for all tastes. This includes our famous home-made 'Warreners Pie' (a rabbit feast made to the Inn's own recipe) - we cook the fresh rabbits and pick the meat from the bones. Our home-made Steak and Ale Pies are made using local Dartmoor beef and real ale from the pump, pies are topped with our own home-made short-crust pastry. There is a variety of Ploughman’s Lunches with freshly baked baguettes using local meats and cheeses along with a delicious west country Cider & Apple chutney. Locally made Jumbo Sausages are also a favourite. Another popular meal is local traditional cold ham with chips and peas. There is also an interesting selection of vegetarian dishes - we ensure that our cheeses and desserts are suitable for vegetarians. We make our own hearty Soups using fresh local produce. In the evenings our menu offers even more choice, including a selection of Steaks using prime Dartmoor beef, braised Dartmoor Lamb Shanks with a rich red wine & rosemary gravy, and pan fried Cajun Chicken with a spicy Cajun dip. On Sunday lunch-times we serve a traditional Sunday roast. We use fresh local vegetables with the exception of peas. We strive to use local produce and our suppliers include Moorland farmers R & S Perryman, the highly reputable P.J. Howells of Tavistock, J.C. Hams, Tamar View, who all supply us with top quality delicious fresh meat and vegetables. 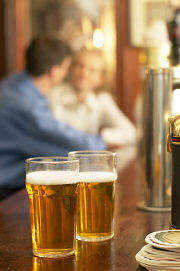 We offer a fine range of well kept real ales including Old Thumper, Otter, Tribute & Doom Bar. 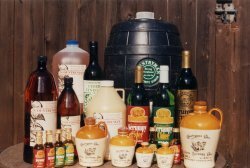 Sometimes we replace an ale with a guest beer such as Teignworthy, Tanglefoot or Butcome Bitter. Our farm Scrumpy is from Countryman Cider in Milton Abbot and we stock many other ciders including Thatchers on pump, and a selection of bottled ciders - even Pear is proving to be popular. In the cold winter months a warming glass of hot Mulled Wine is a welcome treat and again we source our drinks as locally as possible. There is a vast selection of soft drinks and a good range of malt whiskeys. 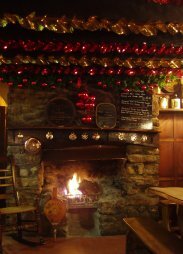 You can experience a truly relaxed atmosphere with good home-made food, friendly service and a fine selection of drinks in a traditional Moorland Inn, come try it and see….